I was about 8 when I first learned to bike. My dad would take me out on our street in Baltimore, grasping the frame to make sure I didn’t lose my balance as I shakily pedaled. I didn’t get it right away–that is, until I got it. One afternoon I took my little bike out by myself, hopped on, and just cruised around and around our cul de sac. I might have wobbled, but I didn’t fall. I still remember the feeling of elation that whipped through me. That feeling around biking has only grown as I’ve gotten older. I owned a Motobecane in Chicago that I loved the way some people love their pets, even when the fork snapped and sent me tumbling in a freak accident just off Lawrence Ave. I rode that bike to class every day; I rode it countless times to the other side of the city, traversing its streets. Much of how I got to know, and love, Chicago was by bike. Biking in a city creates a uniquely close engagement with the urban landscape. You’re not sequestered inside two tons of steel: you feel the beating sun, the rain, every bump in the road, on two wheels. It allows you to take in wide swaths of the city that would be impossible to cover by foot. Biking in Chicago enabled a constant process of discovery that ultimately made me feel deeply connected to the city. There was always another neighborhood to explore, a new side street to roll down. It empowered me with independence and the knowledge that I could get myself around my city. There’s something magical, and freeing, about coasting at top speed on a bike–a sentiment straight from age 8. When I think about moments of pure, unfettered happiness in the last few years, many of them came on a bike. 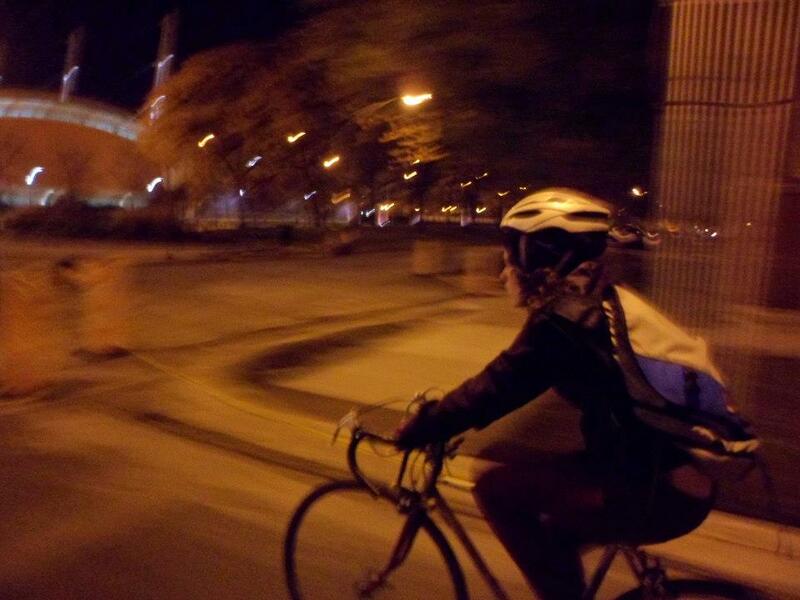 Riding a bike frequently allows me to think through things and to clear my head. It’s a socially acceptable way to spend a lot of time alone. It’s also a fantastic way to spend time with friends, particularly those who know the city and its bike routes better than you (thanks, Rafael). I want to say something horribly cliche about how it’s all about the (bike) journey and not the (bike) destination, but this was actually true of my life in Chicago. The opportunity to just go for a ride was always as big a draw as wherever we were going to end up. Speaking of community, I’ve been heartened to see how much bike activity there is here in Detroit. One way to make the streets safer for cycling is to get more people out there doing it. I’ve been going on the weekly Slow Roll rides, the most recent of which drew 1500 people. I’ve already made new friends and seen more of Detroit in 3 weeks than I otherwise would have. So these are all the sunny feelings that underlie my decision to do Motor City car-less, at least for now. I didn’t talk about the countless near-misses of almost getting side-swiped or doored by cars, and the sheer luck of having avoided any major accident thus far. I also didn’t mention how having a bike as my primary mode of transport constrains my ability to go places and sometimes necessitates me to rely on the kindness of friends–and how these limitations on my independence are endlessly frustrating. And I didn’t talk about the implications of that decision for my personal safety in this city. I don’t have easy answers for these issues, which is partially why I get defensive when people question my choice to go car-less in Motor City. All I can say is that for now–and particularly being in a new place, with the ability to consciously shape my persona–biking forms a significant part of my identity. I love riding, and care about making the city more bike-friendly. And I hope and expect that biking will bring me closer to the place where I’m living but don’t yet call home. Detroit’s in Shambles, and I Can’t Wait to Move There.